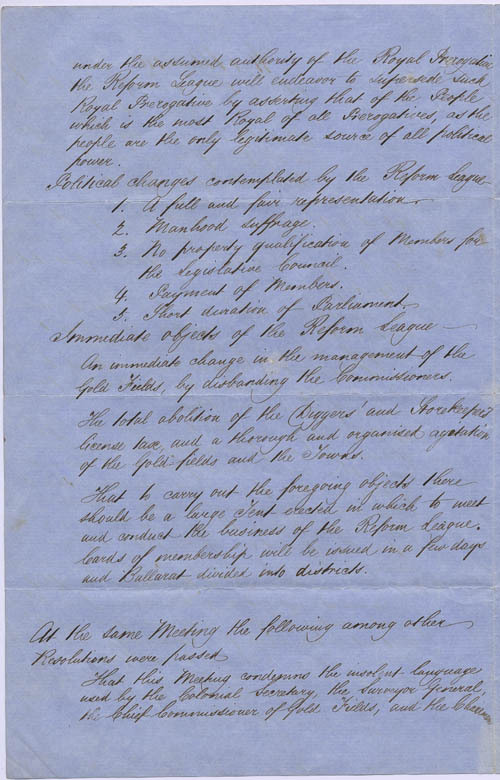 Difference between revisions of "Ballarat Reform League"
To view the whole document with transcripts go to [[Public Record Office Victoria VPRS 4066 Bakery Hill Meeting of 11 November 1854]]. 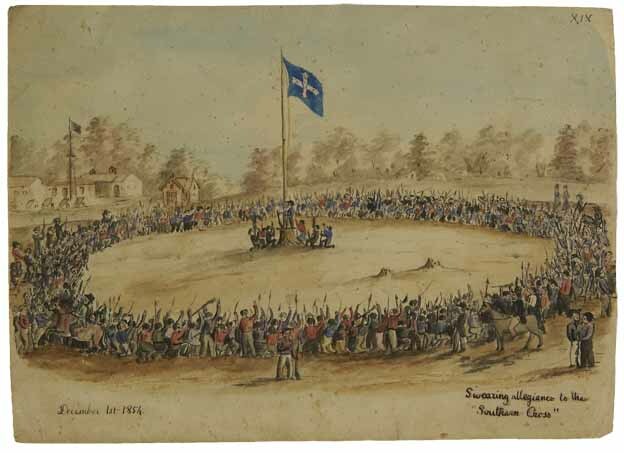 Charles A. Doudiet, Swearing allegiance to the 'Southern Cross’, 1854, watercolour, pen and ink on paper. To view the whole document with transcripts go to Public Record Office Victoria VPRS 4066 Bakery Hill Meeting of 11 November 1854. The Ballaarat Reform League was a movement that grew out of the frustration that the diggers felt with their treatment on the goldfields. Within a month of the official discovery of gold in Victoria in August 1851, the new Victorian government had imposed a large licence fee for the right to dig for gold. The fee was unpopular but the even greater irritant was the heavy handed, and at times corrupt, administration of the goldfields by the local officials. Eventually collecting licence fees became armed hunts. Active for a brief time around October and November 1854. The committee was known to meet at The Star Hotel in Main Road, Ballarat, and was though to have initially formed to organise the defence of prisoners taken for the burning of Bentley's Eureka Hotel (17th October 1854). The committee went on to discuss and formulate a Charter outlining such goals as manhood suffrage and full and fair representation. The die is cast and fate has stamped upon the movement its indelible signature. No power on earth can now restrain the united might and headlong stride for freedom of the people of this country and we are lost in amazement while contemplating the dazzling Panorama of the Australian future. We salute the league and tender our hopes and prayers for its prosperity. The league has undertaken a mighty task fit only for a great people – that of changing the dynasty of the Country. The League does not exactly propose nor adopt such a scheme but we know what it means the principles it would inculcate and that eventually it will resolve itself into an Australian Congress. It is not for us to say how much we have been instrumental in rousing up the people to a sense of their own wrongs. We leave that to the public and the world. In forming its goals, the Ballarat Reform League's objectives were very closely aligned to those of British Chartism movement's objectives. 3. No property qualification of Members for the Legislative Council. 5. Short duration of Parliament. It is not fines, imprisonments, taxation and bayonets that is required to keep a people tranquil and content. It is attention to their wants and their just rights alone that will make the miners content. Charles A. Doudiet, watercolour on paper, 1854, watercolour, on paper. Ballarat Reform League Deputation to Governor Charles Hotham from The Revolt at Eureka’ by R. Wenban. Schools Publishing House, 1959. A mass meeting of around 10,000 people was held near the site of the Eureka Hotel to urge a more thorough investigation into James Scobie's murder. The organising committee included Peter Lalor as secretary. This was Lalor's first leading role in the goldfield agitation at Ballarat. The crowd grew aggressive and the Eureka Hotel was looted and burnt to the ground. By 2.00pm on 22 November 10-15,000 people met on Bakery Hill. 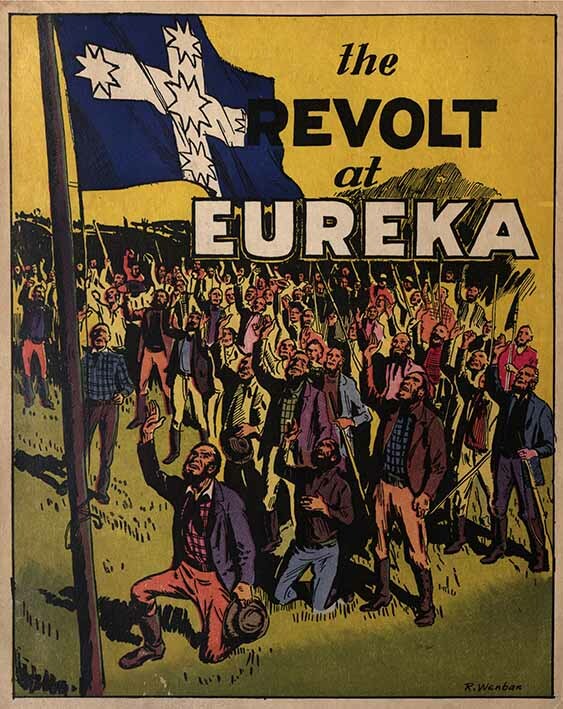 They supported motions calling for funds to defend Andrew McIntyre, and Thomas Fletcher, claiming the burning of the Eureka Hotel was the result of inept Camp Officials. The men accused of destroying the Eureka Hotel, Henry Westerby, Thomas Fletcher and Andrew McIntyre, were convicted and sentenced to gaol on 20 November 1854. J.B. Humffray, Black and Kennedy, representing the Ballarat Reform League demanded the release of these prisoners on 27 November 1854. It was a fatal mistake, as the use of the word “demand” strengthened Governor Hotham’s resolve for control. Yesterday we had our monster meeting on Bakery Hill. The proceedings began soon after three o'clock. The usual accompaniments of flags and music were not wanting to add to the effect of the affair. The chair was occupied by Mr Hayes, and Messrs Holyoake, A. Black, Humffray, G. Black, Kennedy, Krew, Burke, Reynolds, and Spong, submitted and supported the following resolutions, all of which were carried unanimously and enthusiastically. 1. That this meeting demands the immediate dismissal of Serjeant-Major Milne, because he is a dangerous and disreputable scoundrel, and one who is a disgrace to any government that employs him, and further, that the authorities who continue to employ such a knave are unworthy of either the confidence or respect of the inhabitants of Ballarat, and that a committee be appointed to make known the demand of this meeting. 2. That this meeting condemns the insolent language used by the Colonial Secretary, the Surveyor-General, the Chief Commissioner for the Gold Fields, and the Chairman of Committees, in their unwarrantable assertions respecting the veracity of the diggers, and the respectability of the representatives of the public press on the gold-fields, and their sneering contempt at an appeal for an investigation into the mal-practices of the corrupt Camp at Ballarat. 4. That this meeting expresses its utter want of confidence in the political honesty of the government officials in the Legislative Council, and pledges itself to use every constitutional means to have them removed from the offices they disgrace. That this meeting also expresses its disapprobation of the mode in which the board of Enquiry was appointed — that it ought to have been composed of independent gentlemen, and not of paid government officials. The prospectus alluded to in resolution 3, is this :— Principles and objects of the Ballarat Reform League — That it is the inalienable right of every citizen to have a voice in making the laws he is called upon to obey. That taxation without representation is tyranny." That being, as the people have hitherto been, unrepresented in the Legislative Council of the colony of Victoria, they have been tyrannised over, and it becomes their duty as well as their interest to resist, and if necessary, to remove the irresponsible government which so tyrannises over them. That this colony has hitherto been governed by paid officials upon the false assumption that law is greater than justice, be- cause, forsooth, it was made by them or their friends, and admirably suits their selfish ends and narrow-minded views. That it is the object of the League to place the power in the hands of responsible representatives of the people; to frame wholesome laws and carry on an honest Government. That it is not the wish of the League to effect the immediate separation of the colony from the parent country, if equal laws and equal rights are dealt out to the whole free community; but that if Queen Victoria continued to act upon the advice of dishonest ministers, and insists upon indirectly dictating obnoxious laws for this colony, under the assumed authority of Royal prerogative, the Reform League will endeavour to supersede such Royal prerogative by asserting that of the people, it being the most Royal of all prerogatives, as the people are the only legitimate source of all political power. 1. A full and fair representation. 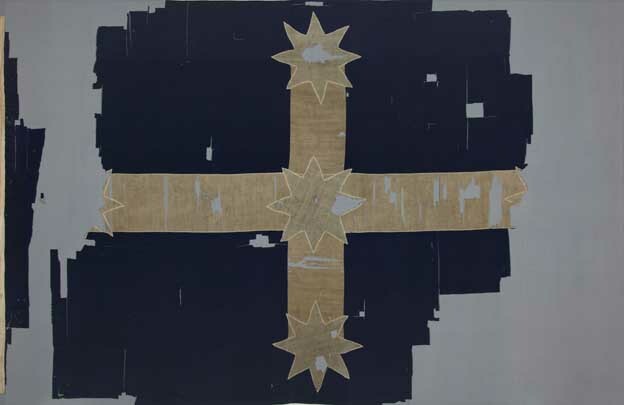 Unknown maker (Australia), The flag of the Southern Cross (Eureka Flag), 1854, wool, cotton. The Revolt at Eureka’ cover by R. Wenban. Schools Publishing House, 1959. Attorney Alexander Fraser wrote to the Ballarat times: I was with a painful interest that I went to the meeting on 29th November. Some time after the proceedings had commenced, the only political meeting I had ever attended in the colony, and I was at once deeply struck with the solemn earnestness of its tone, and with the absolute unanimity of sentiment which seemed to prevail; knowing, therefor, from what I myself had experienced from the abuse of local authority, what many others must have felt from a sense of perhaps more recent injustice, it appeared to me as plan as noon day that disastrous results must arise unless the policy pursued on the gold fields were completely altered, and the daily and hourly irritation caused by the collection of the license tax entirely given up. Proposed by Mr Reynolds, seconded by Mr Weeks_!. "That this meeting views with the hottest indignation the daring calumny of his honor the Acting Chief Justice, while on the bench, of the brave and struggling suffers of Clare, Tipperary, Bristol, and other districts, on their endeavors to assert their legitimate rights; and do hereby give the most unmitigated and the most emphatic denial to the assertions of his honor in stigmatising as riots the persevering and indomitable struggles for freedom of the brave people of England and Ireland for the last eighty years." Proposed by Mr Lalor, seconded by Mr Brady-2. "That a meeting of members of the Reform League be called at the Adelpi Theatre for next Sunday, at 2p.m., to elect a central committee, and that each fifty members of the League have the power to elect one member for the central committee." Proposed by Mr Frederick Vern, seconded by Mr Quinn_3. "That this meeting, being convinced that the obnoxious license-fee is an imposition and an unjustifiable tax on free labor, pledges itself to take immediate steps to abolish same, bu at once burning all their licenses. That in the event of any part being arrested for having no licenses, that the united people will, under all circumstances, defend and protect them." Proposed by Mr G. Black, seconded by Mr Wheatley_4. 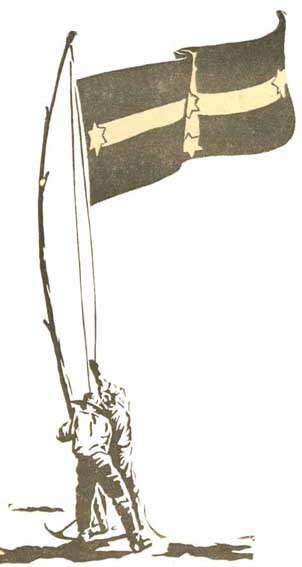 "That as the diggers have determined to pay no more licenses, it is necessary for them to be prepared for the contingent; as it would be utterly inconsistent, after refusing to pay a license, to call a Commissioner for the adjustment of such disputes, the parties so disputing shall each appoint one man. the two men thus appointed to call in a third, and these three decide the case finally." Proposed by Mr Murnane, seconded by Mr Ross_5. "That this meeting will not be bound to protect any man after the 15th December who shall not be a member of the League by that day." Proposed by Mr Humffray, seconded by Mr Kennedy_6. "That this meeting protests against the common practice of bodies of military marching into a peaceable district with fixed bayonets, and also any force, police or otherwise, firing on the people, under any circumstances, without the previous reading of the Riot Act, and that of the Government officials continue to act thus unconstitutionally, we cannot be responsible for similar or worse deeds from the people." The architects of the Ballarat Reform League were British Chartists George Black, Henry Holyoake, Henry Nicholls, Thomas Kennedy, J.B. Humffray, Peter Lalor, Timothy Hayes and Frederick Vern. If Queen Victoria continues to act upon the ill advice of dishonest ministers and insists upon indirectly dictating obnoxious laws for the colony, ... the Reform League will endeavour to supersede such Royal prerogative by asserting that of the people, which is the most royal of all prerogatives, as the people are the only legitimate source of all political power. BALLARAT. — November 10th, 1854. — The official commission closed its sittings to-day, saying that they believed they had obtained information and taken down statements of every real and fancied wrong under which the diggers of Ballarat groaned. 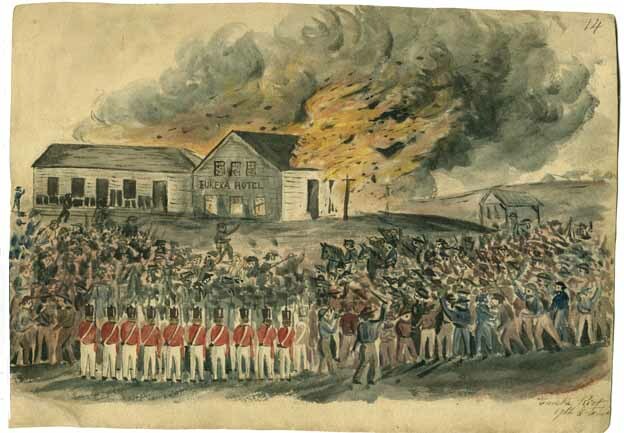 A deputation from the com-mittee of the Ballarat Reform League waited upon the board to-day, and presented a statement of their opinions of the cause of the so- called riot and present agitation, deducted from ascertained facts; they contended that Bentley's Hotel had been burned down through the corrupt condition of the Camp, and that the present agitation on the gold fields arises from a conviction that the people never can ensure good laws, and the due administration of them, until they have free and fair representation, and that the diggers would not be satisfied with anything else. A meeting was held in the Adelphi Theatre this evening by the American people at Ballaarat, for the purpose of deciding upon the propriety of inviting J. M. Tarleton, Esq., United States Consul, Melbourne, and George Youngson, Esq., late United States Consul, Geelong, to an American dinner party (not as Mrs Farlington may suppose, to an American tea-party). The meeting was numerously attended by Americans, and a sprinkling of friends; Dr. Kennedy presided. A committee was appointed to carry out the views of the meeting, and make all the necessary arrangements for the reception of the American Consuls. Several American gentlemen spoke, and all were unanimous in expressing a wish that the American people residing on the Ballaarat gold-fields should give a reception worthy of the representatives of a mighty country. These sentiments were well cheered, and no doubt will be fully developed in the arrange-ments. A complimentary benefit to Mrs. Hammer, of the Adelphi, was proposed, and a committee appointed to carry it out. I should not forget to mention that Mr. Smith, of Adams and Co.'s Express, invited all parties at the close of the meeting to take a glass of champagne at the Arcade Bowling Saloon, where sentiment and song went merrily round with the glass. We salute the League [but not the trio, Vern, Kennedy, Humffray] and tender our hopes and prayers for its prosperity [in the shape of a goodly pile of half-crowns]. The League has undertaken a mighty task [the trio’ll shirk it though], fit only for a great people - that of changing the dynasty of the country [Great Works]. The League does not exactly propose, nor adopt, such a scheme, but we know what it means, the principles it would inculcate, and that eventually it will resolve itself into an Australian Congress [Great Works!!]. On Monday His Excellency received Messrs. Black, Humphreys, and Kennedy, the three gentlemen appointed as a deputation from this locality to "demand" the liberation of Fletcher, M'Intyre, and Westbury, convicted of burning of the Eureka Hotel. The deputation handed His Excellency certain representations on paper, agreed to at a meeting of the diggers, and a prospectus of the Ballarat Reform League, by which the political and administrative claims of the diggers were brought in review. At the outset of the proceedings, however, His Excellency said the deputation had used a term which, as the representative of majesty, he could not allow, viz., the word " demand." and asked if the deputation " demanded" the liberation of the men convicted of burning the Eureka Hotel. Mr. Black had no other explanation to offer than that they had stated their business in the terms furnished them by the diggers. The diggers did not consider the three convicted men more guilty than others present at the fire, and justified the act of burning the hotel by the fact that the magistracy at Ballarat had become so corrupt as to require some such signal act to recall them to a sense of their duty; and if the constitutional mode of petitioning His Excellency had been adopted, time would thereby have been afforded for the escape of the offenders. His Excellency said that the deputation must be aware that whenever the Government heard of the acquittal of Bentley, a new trial was ordered. On the instant, orders were issued, and the most active measures taken to apprehend Bentley, and try him again. A government did not identify itself in all cases with the verdict of its own officials. In this case it judged that the verdict was not correct, and ordered a new trial immediately. Mr. Black said that the announcement by Mr. Johnstone that he had forwarded the depositions to the Attorney-General, and that he, with the approval of His Excellency, had ordered a new trial, and that the parties should be re-arrested, had been received by the meeting with a great cheer. His Excellency said that the diggers were taking the law into their own hands, and setting aside the most important principle of the British Constitution. Mr. Humphreys thought His Excellency might extend an act of grace to the:prisoners. His Excellency said he could not depart from the verdict of the jury. After a patient and careful hearing, the jury had decided. That decision all were bound to respect, and were he to depart from it he should inflict the greatest possible blow on the welfare of the colony. Mr. Kennedy entreated His Excellency to allow the men to return with them and then any further riot and disturbance would cease. His Excellency thought the course suggested subversive of all government, and, as the Queen's representative, it was impossible for him to do what they asked. He further remarked that, as to the management of the gold fields, he had selected the most liberal and popular men to form a commission of enquiry, and was prepared to carry out any measure of reform which that com- mission may recommend, as far as his power went; and he expressly desired the deputation to tell the diggers that he was most anxious to give full justice to the diggers as well as any other class in the community, and he hopped they would give him credit for such intentions, but that at present his power of doing so was limited. The Colonial Secretary and Attorney-General were present during the interview, and occasionally took part in the discussion. At the close of the interview, the question was put— "If a memorial is presented on behalf of M'Intyre and the other prisoners, to Your Excellency, may we indulge in the hope that its prayer would be granted?" His Excellency replied — "Present your Memorial." The interview lasted for some time, and the deputation expressed their high satisfaction at the candid manner in which their questions were answered, and an im- pression that the Governor is an honest man, and will eventually do the diggers justice. ↑ http://www.spiritofeureka.org/index.php?option=com_content&view=article&id=52&Itemid=51, downloaded 08 March 2013. ↑ Toscano, Joseph, Reclaiming the Radical Spirit of the Eureka Rebellion, Anarchist Media Institute, Parkville. ↑ http://www.ballaratreformleague.org.au/, downloaded 07 March 2013. ↑ MacFarlane, Ian, Eureka from the Official Records, Public Record Office of Victoria, 1998, p192-3. ↑ MacFarlane, Ian, Eureka from the Official Records, Public Record Office of Victoria, 1998, p 193. ↑ Geelong Advertiser, 14 November 1854. ↑ From Tent To Parliament, Berry Anderson & Co., Ballarat. ↑ Withers, W.B., History of Ballarat and Some Ballarat Reminiscenses, Ballarat Heritage Service, 1999, p.63-4. ↑ Wither, W.B., History of Ballarat and Some Ballarat Reminiscences, Ballarat Heritage Services, 1999, p238. ↑ Beggs Sunter, Anne, Eureka the First Republic?, Ballarat Fine Art Gallery, 1997. ↑ The Argus, 14 NOvember 1854. ↑ Ballarat Times, 18 November 1854. ↑ Ballarat Times, 23 November 1854. ↑ The Age, 29 November 1854.